How will AgriTech contribute to building a Britain fit for the future? ARC’s potential contribution to building a Britain fit for the future is immense. So, please support Cambridge in playing its part in building a Britain fit for the future by adding a comment or attaching a letter of support on the planning portal. SmithsonHill, the commercial property developer specialising in collaborative environments in our region, promised to summarise how securing the East of England’s position as UK’s AgriTech lead region will not only positively impact the economic development of our region, but of our country and the global agri-food sector too. Since then, the Government has published its new Industrial Strategy, heralding a new approach to how government and business can work together to shape a stronger, fairer economy. The paper promises much, including increased funding in research, skills and infrastructure to amplify regional strengths. It’s good news for Cambridge and for SmithsonHill’s proposed AgriTech Park, ARC, too …. When the Government’s Industrial Strategy was launched in November, it came of no surprise to us that Artificial Intelligence (AI) and clean growth (sustainable energy) were defined as industries of strategic value to the UK economy. If you’ve read our previous articles describing the evolving role of AgriTech in our region, it may not have come as a surprise to you either. In fact, you may, like us, have found the strategy reassuring. What is the aim of the Industrial Strategy? The Industrial Strategy aims to create an economy that boosts productivity and earning power throughout the UK. 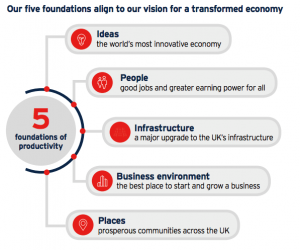 It proposes so doing by focussing on the five foundations of productivity (the essential attributes of every successful economy) across four grand challenges that will put the UK at the forefront of tomorrow’s industries. These challenges are: AI and Data Economy; Clean Growth; Future of Mobility and Ageing Society. What is the Government actually going to do to realise this plan and how will ARC help? Agree Sector Deals which will drive transformation in investment and productivity across the economy. ARC is a specialist site for research into agriculture technology, an area ear-marked for investment in the document. It’s in Cambridge, a city named as a job creation hotspot within the strategy. It has been planned to ensure improved connectivity between London, Stanstead, Cambridge and Norwich and it will enable the Government to achieve its first Sector Deal ambition – setting up a new partnership between the whole food chain. In short: ARC will enable the Government to fulfil many of the commitments made in the Industrial Strategy. Why has the Government recognised AgriTech as an industry that will put the UK at the forefront of tomorrow’s industries? The Government has recognised in its Industrial Strategy that AgriTech is a growing sector of vital importance to the global economy and will be inviting competing proposals for promising projects in this priority business sector to support and fund. Why? Because population growth means that global food demand will increase by up to 100% before 2050 and global agriculture is responsible for 25% of global greenhouse gas emissions. Rising global demand for food and water is increasing the need for agriculture that produces more from less. The global community need to research, develop and commercialise new technologies to increase crop production and yield, minimise input and cost (both to the consumer and farmer) and reduce the carbon footprint of agriculture. Multiple sectors (including non-agricultural) are in need of a collaborative environment to apply their expertise to AgriTech and work alongside experienced members of the industry. Cambridge is well positioned to bring cross sector experts together. ARC will not only put Cambridge and the UK at the forefront of tomorrow’s industries. It can play a part in securing future food global sustainability. Whilst we’re talking global, it’s also of note that, as the global market expands, the Government has committed to increasing its export support for AI and data businesses. Indeed, the Global Entrepreneur Programme will look to increase its focus on attracting AI and data-led businesses to establish headquarters in the UK. ARC could be one such headquarters. What else is the Government promising? The case for a specialist space for agricultural technology in Cambridge gets stronger as AgriTech fits in the strategy beyond the AI and Data Technology challenge. One of the many applications of AgriTech focussed AI and data analytics solutions is to enable more efficient use of energy and resources. For example, intelligent algorithms applied to data on atmospheric conditions and soil moisture could dramatically reduce the amount of water needed for agriculture. Can you see how actions to support the Government’s first Grand Challenge (AI and Data Technology) will complement its second challenge: Clean Growth? We can, which is why sustainability is embedded in our ARC plans. As well as looking to attract tenants developing clean energy solutions, ARC will facilitate greener living and active lifestyles with open spaces, shared leisure routes, local and accessible transport. It will encourage the use of electric vehicles, be sympathetic to the landscape and local ecology and deliver sustainability through onsite energy capture, reuse and generation. All of the above means ARC meets the requirements of the Government’s Natural Capital Committee, which is tasked to invest in circular economy projects. Circular economy projects increase productivity by using natural resources efficiently, increase resilience by contributing to a healthier environment and support long term growth by regenerating natural capital. They been shown to generate returns of up to nine times the cost. ARC will also provide the home to innovators looking to lead the development of smart energy systems and the ‘bio-economy’ (which means the use of renewable biological resources from land and sea to produce food, materials and energy). It will ultimately enable everyone, not just South Cambridgeshire residents, to feel the benefits of clean growth. Our city, with ARC, will benefit from regenerated natural capital. We can help to create a future where other cities and countries can benefit from cleaner air and other businesses benefit from enhanced resource security too. We can help to build a Britain fit for the future. The UK has a thriving food and drink sector, in fact, it’s the largest manufacturing sector in the UK with the wider food chain contributing £112bn GVA and employing one in eight people across the UK. The sector’s enduring strength is built on strong agricultural and manufacturing foundations. Opportunities and challenges for food and drink raised by exiting the EU though, are significant. As such, the Government is committing to establishing a new partnership between government and the whole food chain, working with industry leaders from agriculture, food and drink manufacturing, retail, hospitality and logistics. An early task for this sector council will be to build on emerging proposals for a sector deal in food and drink manufacturing, including support to capitalise on innovation opportunities in sustainable agriculture and food manufacturing. ARC is a purpose-built space in South Cambridgeshire designed to facilitate ‘more’. It’s potential contribution to building a Britain fit for the future is immense. So, please support Cambridge in playing its part in building a Britain fit for the future by adding a comment or attaching letters of support on the planning portal.